As a former Army Officer I worked around everything from sidearms to tanks. I am very aware of the intense levels of noise that military personnel are exposed to. For many years I have suffered with partial hearing loss, likely resulting from time spent either firing weapons or being around weapons systems. Because almost every soldier, sailor, airman or marine will be exposed to hazardous noise levels during their career, the prevalence of hearing loss and tinnitus for military personal is greater than that of the general public. If you are suffering from service-related hearing loss or tinnitus and used 3M ear, contact me to discuss your potential claim. Service-related hearing loss or tinnitus? To find out if you may be entitled to compensation from 3M complete this form for a complementary claim review. 3M - Protector or Deceptor? In an effort to alleviate some, or all, of the debilitating results of this exposure some military personnel were issued 3M or Aearo earplugs. 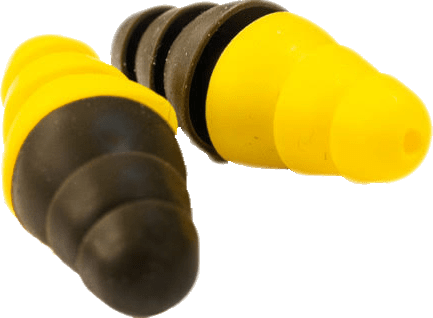 Worn with the yellow end of the plug inserted in the ear, ideally the earplugs would allow officer’s orders to be heard while protecting against hearing loss and tinnitus. Trusting the reliability of the gear they were issued, military personnel unquestioningly used these earplugs. Unfortunately, they were never warned of the defects in the earplugs nor were they adequately instructed on how to wear the earplugs. It has become apparent that 3M (purchased Aearo) was aware of the problem and knew that testing procedures and fitting instructions were unlawfully manipulated. As a result, 3M has paid the Department of Defense $9.1 million dollars to resolve the accusations against them. This settlement did not compensate service members for damage they may have suffered as the result of using this defective product. Because of the deception and fraud committed by this large corporation, you may be suffering from partial hearing loss or tinnitus if you were issued hearing protection in the form of 3M or Aearo earplugs while serving in the Military between 2003 and 2015. The impact of Tinnitus and Hearing Loss can be severe, resulting in social isolation, anxiety, sleep problems, inability to work, among other things. No one should profit at the expense of our Veterans’ health and well being! I know personally how debilitating a hearing deficit can be. If you are suffering from any of the above described symptoms, contact me. Let me, Rick McGuire, Attorney at Law and former Captain, USAR, ADA, help you. Contact Us. Get the help you deserve.